This article is written from my professional point of view and experience with my own pregnancy. Always be sure to consult your doctor regarding overall health and any training regimen throughout your pregnancy. Your first pregnancy: shock, excitement (sure, a little twinge of fear), and total reverence for your body and what it can do. My husband and I were thrilled – we took some time to celebrate, but right away I vowed to continue my training program. 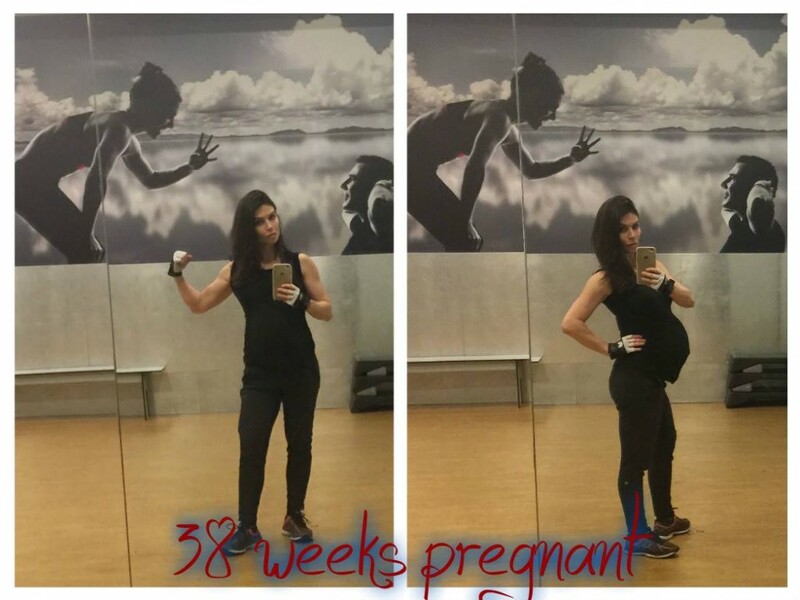 Throughout almost my entire pregnancy (39 weeks and 6 days of the 40 weeks and 2 days), I remained committed and worked out at the gym. I had always been active in a variety of athletics, but about 5 years before my pregnancy, I’d begun weight training and fell in love with it. I got hooked on the determination – getting stronger, watching myself progress, and reaching my goals and creating new ones. The connection between weight training and nutrition led me to study sports nutrition and become a professional sports nutritionist and strength coach . According to the American Association of Obstetricians and Gynecologists, “Physical activity in pregnancy has minimal risks and has been shown to benefit most women, although some modification to exercise routines may be necessary because of normal anatomic and physiologic changes and fetal requirements. Women with uncomplicated pregnancies should be encouraged to engage in aerobic and strength-conditioning exercises before, during, and after pregnancy.” I began my pregnancy at my regular level, slowly decreasing weight as the pregnancy progressed. How did the outside world react to “fit” Orit training with her belly, using almost her usual weights range? Well, I found out there’s a definite stigma attached to WTWP (Weight Training While Pregnant). As I’m sure has been the case for millennia, everyone becomes a medical professional when interacting with pregnant women. I received countless looks, reactions, and recommendations from non-experts about how I should train during my pregnancy – people decided to step in and become my coach or doctor, thinking they knew my body better than me. But, my actual doctor had assured me that I was on a healthy path. Every day we choose how to react to the opinions of those surrounding us. I was gifted with selective hearing, so a lot of the comments just washed passed me, and I continued to behave like a woman with a principal goal: managing a healthy body for myself and my baby. In many ways my training only brought me closer to the little girl in my belly. And the secondary goal was to stay sane because, let’s be honest, we all have a tendency to lose it from time to time. Clear you mind of can't. No one ever said pregnancy was easy, but staying focused, taking the time to relax and learn how to manage your pregnancy (and not the other way around), will give you the clear mind to continue working your muscles and keep your daily motivation high. You probably already know your strengths and weaknesses in most situations. Learn how to leverage the best of you and recognize when it’s time to give up, because you can do anything but not everything. We all have a bit of negativity and added stress in our lives – soured relationships weighing us down or bad habits we’ve been meaning to quit. Now is the perfect time to cut them out and start fresh because it’s all for the baby. #2 You want your baby to know that you’ve “got her back.” But who’s got yours? Back pain is one of the most common complaints during pregnancy. You’re gaining weight; your center of gravity is changing; and your hormones are relaxing the ligaments in your joints and pelvis. I entered my pregnancy with years of strength training, and I believe this is one of the reasons I had almost no back pains and felt strong enough to train throughout the pregnancy. If you’re planning to get pregnant or already are, back strength is the place to start. I seriously advise against jumping into a “How to Make Your Back Stronger in Only 5 Minutes” kind of plan, but really invest time to work on posture and strength. After consulting with your doctor, you can train with weights in the comfort of your home or at the gym. Rows, pulldowns, and stretches are perfect introductions to back strengthening, in addition to your daily routine, which should include practicing proper posture, wearing the right shoes, and finally taking the time to give yourself a rest and put your feet up. Other common pain areas during and after pregnancy are the neck and shoulders. Hormonal changes, changes in body posture and sleep positioning, hours spent nursing (often in a single position), and thousands of daily repetitive movements lifting and holding, all put added stress on your neck and shoulders. Working your shoulders is useful to achieve better body proportions and keep them strong, flexible, and more coordinated to avoid stress and pain. There are a number of exercise variations and angles to target each of the three shoulder muscles: the side dumbbell lateral raise is one of my favorite, even today, and is generally safe and comfortable to perform while pregnant. Simple shoulder rolls a few times a day always felt like a relief and should be on your regular routine. Stand with your arms hanging straight down, shrug your shoulders forward and up, then roll them back and down. Your hands don’t have the biggest muscles in your body, but they certainly have some of the most important ones. And if I may get a little philosophical here, your hands and arms are representations of your physical and inner strength. You use your hands to build, to make the world a better place. Your biceps represent your power and the feeling that you’re capable of anything. And your triceps are for balance, to remind you that everything depends on you. Through the nine months you have one thing in mind: to exit the hospital with “full hands.” A lot of pregnancy fitness programs will encourage you to work out for toned, slender arms, like you may have had before pregnancy. But I encourage my clients to do bicep curls and triceps kickbacks or dips for fully stronger arms while feeding, nursing, changing diapers, and carrying your precious cargo. Your core includes all the muscles in your midsection: the abdominals, hips, erectors (lower back), and even some of the interconnected muscles in your upper back. Your core helps you remain strong and stable while protecting the most important place on Earth throughout these nine months. During pregnancy, most women experience significant weakening of core muscles, mainly due to stretching and hormonal changes, so it’s important to focus on overall core strengthening, not only abdominal exercising. And this is a good place to talk about weight gain and body fat mass: You want to gain just the right amount to keep up with the weekly health charts, but not so much that it’s even harder to return to your pre-pregnancy body. You should generally remain active and eat a healthy balanced diet that will keep you feeling satiated, energized, and get the nutrients your baby needs, while watching your caloric intake most days. As a sports nutritionist, I admit it was easier for me because I went into my pregnancy with strong nutritional habits. Most of my clients agree that implementing good eating habits before their pregnancy helped them to stay in the normal weight gain range while pregnant and set them up to more quickly return to their pre-pregnancy weight after. They say, “run with your heart,” but at some point it’s okay to walk with it. Just be sure to keep it up! As you progress into your pregnancy, you will begin to lose activity, becoming slower, heavier, and more tired. There may even be days that it’s hard to just get out of bed. Lifting weights may feel uncomfortable as you get into the later 20s and 30-weeks of pregnancy, but not doing any kind of physical activity wasn’t an option for me. If your doctor approves, you should keep up the cardiovascular fitness to benefit you and the baby. Walking 45 minutes was on my daily routine. There was something powerful in this basic movement. Just walking forward gave me strength. Your glutes are going to get bigger, and there’s nothing you can do about it. I did my best to receive it with tranquil self-assurance and love… because everything for the cause, right? It’s important to remember that the glutes are a beautiful muscle group (in any size) and training them will help stabilize and strengthen your body through all of your pregnancy changes. Simple exercises like body weight or band squats, hip thrusts, bridges, and side abductions are great ways to work out at home. Maybe your partner could even join in because they’ll need stronger glutes, too – especially when waking up ten times a night to get the baby! I didn’t give up on my leg training routine until almost the last week of my pregnancy. I listened to my body and continued with everything that still felt comfortable: body weight, weights, or bars (but with lower intensity). In the middle of your pregnancy someone else will start to use their legs, and you’ll feel that first kick. This is your baby reminding you that from now on, every step you take sets an example. Possible the hardest muscle to train for life, but definitely one of the most important. And you’re going to really need it during these nine months. As your pregnancy progresses, every week will get more difficult, but each achievement big or small will strengthen your will – and you’ll realize you have the power to accomplish anything. For me, in order to succeed at something, I have to push myself daily, and you’ll need to, too – especially in the last days of this amazing journey. Keep up with your training as long as your practitioner recommends, likely just doing the basics in the end. Make yourself and your body a priority. Again, you can do anything but not everything. And most importantly, take it step-by-step and day-by-day.